Research continues on the Harrington Seed Destructor’s ability to help manage herbicide-resistant weeds. Field-scale harvest trial in 2017 with HSD tow-behind unit. Photo courtesy of Jennifer Zuidhof. As part of an integrated weed management strategy to manage problem and herbicide-resistant weeds and protect working herbicides from losing their effectiveness, researchers are looking at various strategies including harvest weed seed management. Researchers at Agriculture and Agri-Food Canada (AAFC) in Lacombe, Atla. are conducting a field scale evaluation of the Harrington Seed Destructor (HSD) to evaluate the tool’s efficacy on weeds in Alberta and to determine if efficacy varies by cropping system and management choices. 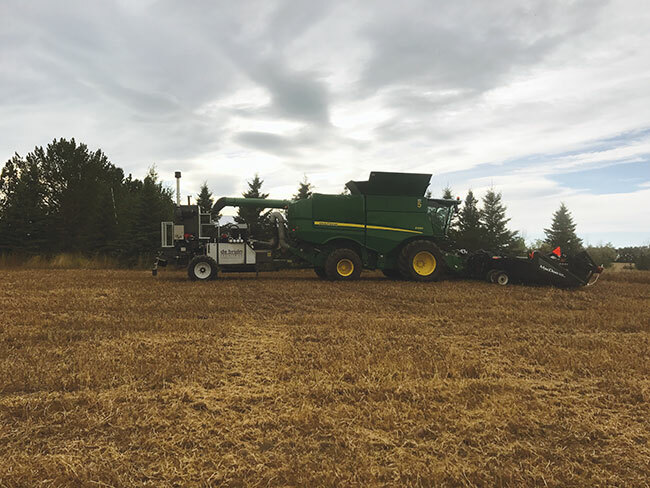 The project will run for three years, and includes replicated harvest trials comparing untreated plots with a regular combine operation and plots with the combine and seed destructor in combination. In the spring of 2018, weed counts were conducted in each plot. The harvest operations were repeated in the fall of 2018 on exactly the same plots in each of the 20 producer fields, and will be repeated again in the fall of 2019. The spring weed counts will be repeated in the spring of 2019 and 2020. “One of the challenges with trying to reduce the seedbank is with persistent weeds like wild oat that often shed their seeds prior to combining,” Tidemann says. Field-scale harvest trial in 2017 using HSD tow-behind unit. Photo courtesy of Neil Harker. 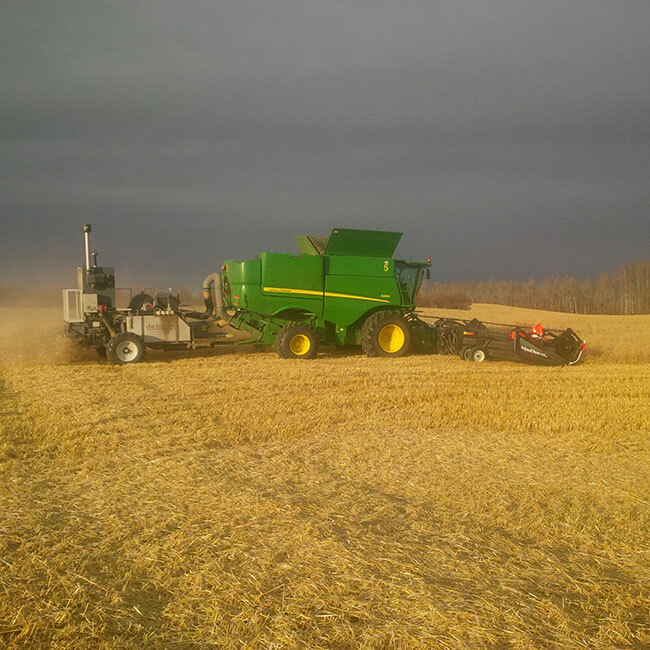 A combine with HSD tow-behind unit for field harvest trials in 2017. Photo courtesy of Breanne Tidemann. Other harvest seed control methods may also be a consideration and may be less costly to adopt. 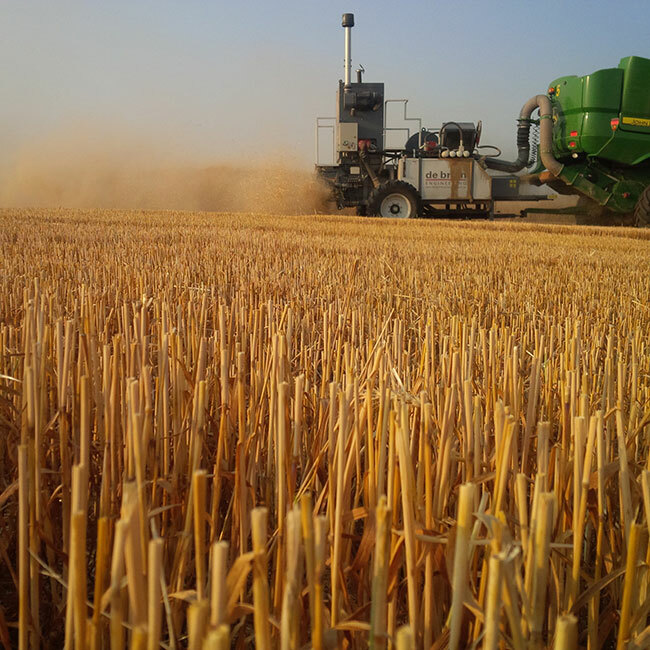 For example, chaff lining is being trialed in Australia where chaff and weed seeds are dropped in a narrow line behind the combine. The chaff, including the weed seeds, can then compost or rot in the narrow row. However, whether or not there would be the same effect under Canadian weather conditions is not known. Either way this type of strategy would limit those weeds to a smaller area and a more targeted herbicide application could be made.